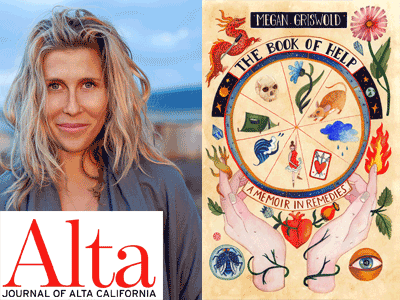 Books Inc. and Alta Magazine proudly present certified doula, shiatsu practitioner, yoga instructor, and personal trainer Megan Griswold in celebration of her critically-acclaimed memoir, The Book of Help: A Memoir in Remedies. The Book of Help traces one woman's life-long quest for love, connection, and peace of mind. A heartbreakingly vulnerable and tragically funny memoir-in-remedies, Megan Griswold's narrative spans four decades and six continents -- from the glaciers of Patagonia and the psycho-tropics of Brazil, to academia, the Ivy League, and the study of Eastern medicine. Megan was born into a family who enthusiastically embraced the offerings of New Age California culture -- at seven she asked Santa for her first mantra and by twelve she was taking weekend workshops on personal growth. But later, when her newly-wedded husband calls in the middle of the night to say he's landed in jail, Megan must accept that her many certificates, degrees and licenses had not been the finish line she'd once imagined them to be, but instead the preliminary training for what would prove to be the wildest, most growth-insisting journey of her life. "In a world full of spiritual seekers, Megan Griswold is an undisputed All-Star. She has spent her life examining her existence in patient, courageous, and microscopic detail, and now she has written about her search with tender and comic honesty. What a delightful journey!" "An inventive, deeply original plummet into self-exploration that is part emotional repair manual, part memoir and entirely wonderful. You'll be wiser for having read it, feel less alone in the world when you're done, and endlessly grateful to Megan Griswold for creating her one-of-a-kind life that lead to this one-of-a-kind book." --Amanda Stern, author of Little Panic: Dispatches from an Anxious Life.